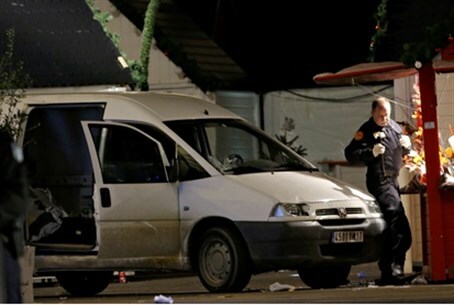 A man drove a van into a crowded outdoor Christmas market Monday evening in Nantes, after shouting "Allahu Abkbar." At least ten people were injured, five seriously, after a van rammed into shoppers at a Christmas market in the French city of Nantes Monday evening at around 7:00 p.m. local time. The driver charged at a chalet in a stall serving hot wine, in front of which several people were gathered, a witness told AFP. One of the traders at the market told local newspaper Presse Ocean that "the white van was speeding towards the customers and onlookers." Video footage on French television is showing a white Peugeot van in the middle of the Christmas market, which was being held in the city's main square, known as the Place Royale area. The market was immediately evacuated following the attack. "His white van got into the Nantes market at around 7 p.m.," said a local police source. "It was driven into a number of people before coming to a halt." "Many were hit, with five requiring particular attention. The attacker was stabbed, but was not killed, despite very serious injuries of his own," he continued. "The market was quickly cordoned off as emergency service workers arrived at the scene to take the injured to hospital." Local newspaper Ouest France, citing a police officer and witnesses on the scene, said the driver, who is being identified as either age 25 or 44, shouted "Allahu Akbar" before plowing into the large crowd of seasonal shoppers at the market. He then stabbed himself "at least nine times" causing himself serious injuries. He was taken to the hospital in critical condition, where he is under armed guard. According to various reports, suicide messages were found inside the vehicle. Nantes police are investigating how the attacker gained access to the pedestrian area normally limited to residents. French authorities are also attempting to determine whether this was a rampage terror attack, but say, as of now, this seems unlikely. A source was quoted as saying that the motives for the attack were unclear but did not appear to be driven by religious extremism. "As things stand, we have no account pointing to any religious demands." Police from Nantes also told local reporters the man was “European” and they had established no religious motives for the incident. Nantes' mayor, Johanna Rolland, said she was “extremely upset by this dramatic event” adding that her “first thoughts are with the families of the victims." The attack comes the day after a mentally ill man yelled "Allahu Akbar" before ramming his vehicle into dozens of pedestrians in the eastern French city of Dijon. 13 people were injured in that incident, which has been ruled to have no link to terrorism. Monday's attack also comes two days after a French convert to Islam was shot dead upon stabbing three police officers while also reportedly crying "Allahu Akbar" in the central town of Joue-les-Tours. Earlier on Monday, French President Francois Hollande called for vigilance after the weekend's attacks, and urged the public to stay calm and not panic.